last night we sat down to watch dancing with the stars which is one of our favorite shows (and leko's favorite show too). we were upset to hear that dwts was cut an hour short last night because of the presidential debate. i don't get involved in politics at all, and i certainly don't watch things like presidential debates. in fact i'm the least political person i know, mainly because i think it is all a bunch of nonsense. i had no intention of watching the debate, but ryan was interested for the "entertainment value" so we left it on after dwts ended. i have to say that after watching most of that craziness, i am convinced our country is doomed. i can't believe that there are over 324 million people in the united states and we've narrowed it down to these 2 people. it's just sad. 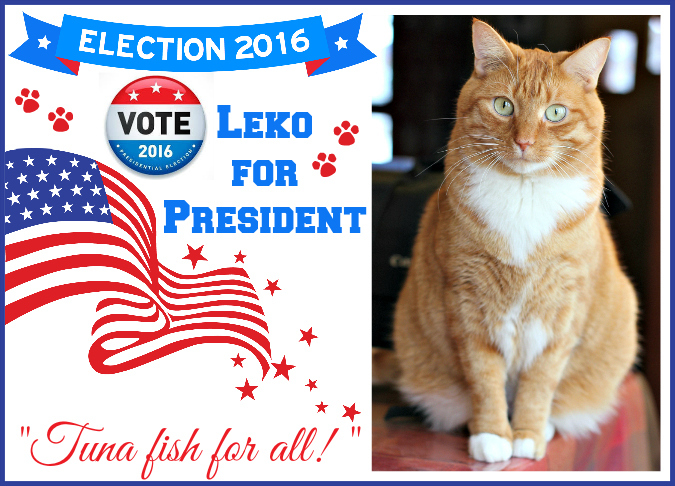 after watching last night, we decided that leko is running for president. his platform is simple: "tuna fish for all!" sounds a lot better than the crap i heard last night. he has my vote! I love your campaign sign!!! If I could vote for Leko I would. We have no good choices, for sure.